Photographs do not travel. It is the world and people who usually travel. Photographs stay in the same place. If images were to travel, then they would be a film and not a photograph at all. Human beings thereafter reduced the size of the camera and began reconstructing it to become “the friend of movement,” but do photographs really travel? It is the division between “travel” and “anti-travel” that is at the origin of the photograph. A powerful impulse is torn apart. Interestingly, during the same period as that of the advent of photography, writers such as Proust and Baudelaire were born, writers who early on understood the possibility for “transformation of the imagination” that photographs provided, as well as Impressionist painters such as Courbet and Manet who “transformed painting.” Alongside them, “inventors of things that move” such as the Montgolfier brothers, inventors of the hot air balloon, were vying for precedence. (Niépce had also created a prototype of a bicycle.) Invention giving rise to division. The stillness of travel/movement. Stamping “world” on a place that one is already in. Is it possible to make a world that is so fluid stop moving? The impossibility of capturing it. The initial impulse, the desire at the time photography first came into being was very powerful. They have been powerful throughout the history of mankind and that is why in the short period of time up to now, photography has infiltrated every place on the globe. Travelling without moving, travelling without travelling. That is a photograph. Yoshihiko Ueda’s purpose, therefore, in moving towards the forest or the river, shouldering a large box camera, is of course not travel. Although Yoshihiko Ueda moves, the photograph does not. He is unrelated to exoticism. It is because he is recklessly trying to go against the current, towards the impulse that a photograph possesses at its origin. He selects a location in which the “world” has opened up for him and tries standing there ”as he is.“ In much the same way as Niépce stood before the view at Le Gras, his camera in position. The thing that is important, however, is something called ”guidance.“ What place should I choose? What should I photograph? As soon as you start relying on ”I“ and ”reasons,“ it disappears/dissipates. In order, therefore, to sense an impulse/guidance, the reason for which is unclear, one has to be scrupulous to a frightening degree. All existing methods are rendered ineffective. What will guide Yoshihiko Ueda? How will he arrive at the origins? 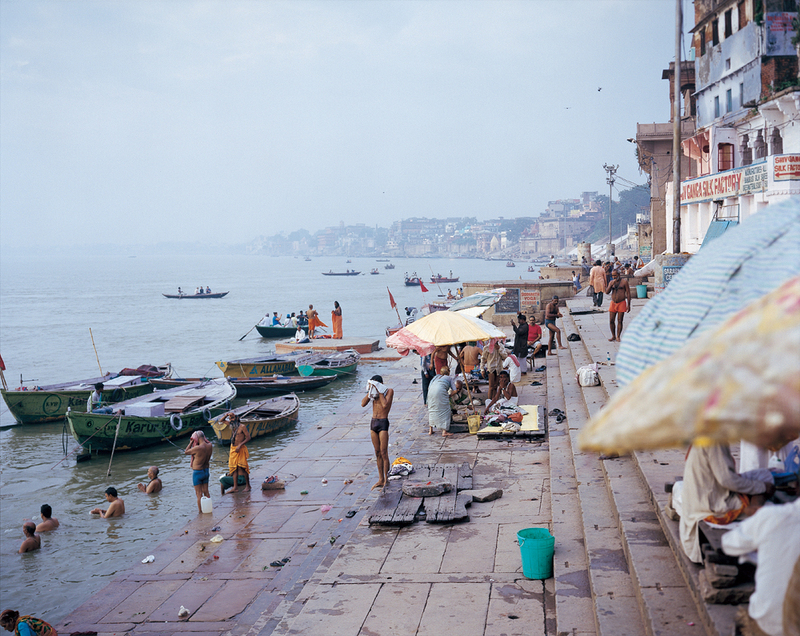 Varanasi at the mouth of the Ganges. Yoshihiko Ueda’s photographs were taken here. 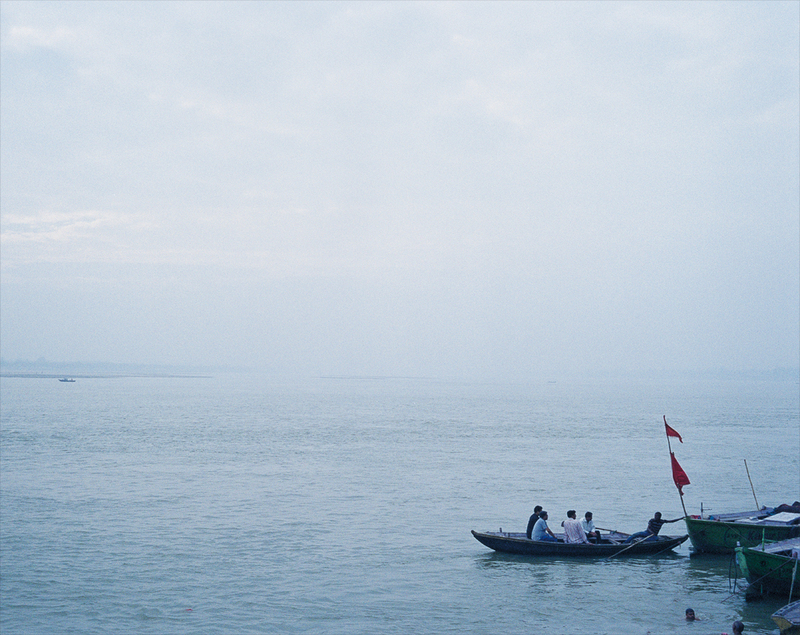 The photographs that started in the forests and rivers of Yakushima have led him to the Ganges. It has already been said above, but what motivates Yoshihiko Ueda is not the foreign land of India or the outlook of the Hindu religion. This large river is a primitive chaos that flushes away the structures that human beings attempt to establish, such as “man versus nature” and “natural versus man-made.” He is merely standing on the most concentrated border where people and water meet, with his camera at the ready. What will come into view as he stands there? What kind of images will pass in front of him? What will the photographs pick up on? The thread that led Yoshihiko Ueda to the Ganges was the rocks scattered in the rivers of Yakushima. In that “connection,” however, there is no logic or association with an image. That intuition is mysterious. There is no such thing as a “reason.” What there is is simply “guidance.” Did something involving “the state of flux and photographs” beckon him? While thinking this may be the case, Yoshihiko Ueda again and again looks back over the photographs he brought back with him. Water is unevenly distributed both in this world and in the human body, and phantasmagorically, it is in the form of a liquid in the river and the sea, floating in the air as a cloud, vaporizing to become invisible. Both plants and animals contain water in equal measure and it is the nucleus of life. The “state of flux” tends to be thought of as a metaphor for a river that flows from the upstream to the downstream, for example, like the large, long scroll painting by the artist Taikan Yokoyama, but I believe that the water itself that is constantly changing in appearance is a form of henge (a fundamental transformation in which something becomes experientially different from before). There is no life or death. There is only constant change. Is that not the blessing of the world that is Materia, the world that is life? 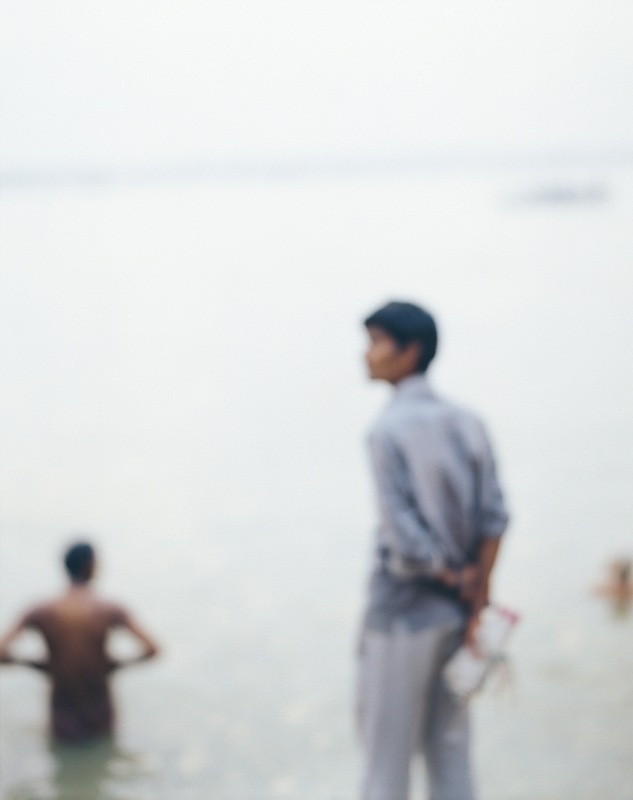 Yoshihiko Ueda stands on the banks of Varanasi, with his large camera at the ready. 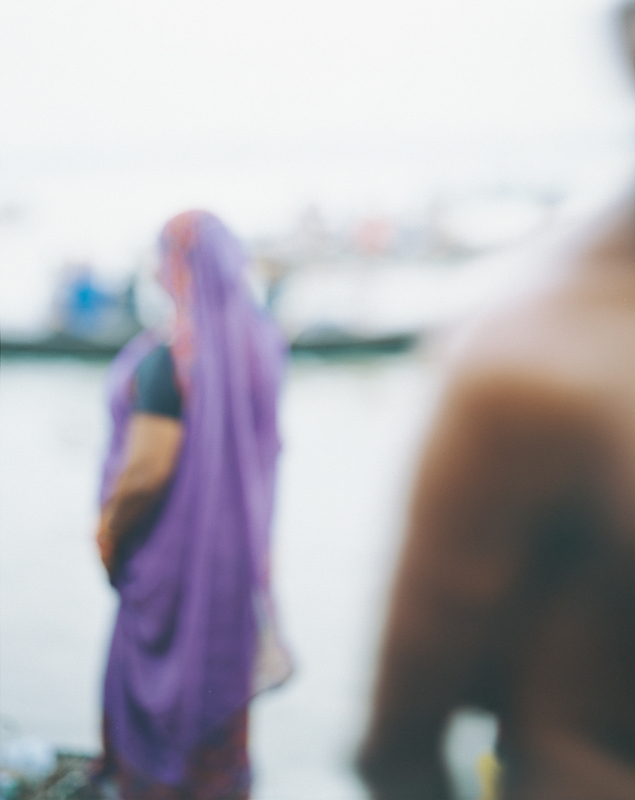 The men gathered at the waterside waiting to bathe in the waters of the Ganges, have on this most special of days, removed all their clothing and are completely naked. The women have adorned themselves in beautiful colors. Once he has decided on the position of the camera, Yoshihiko Ueda does not move it. 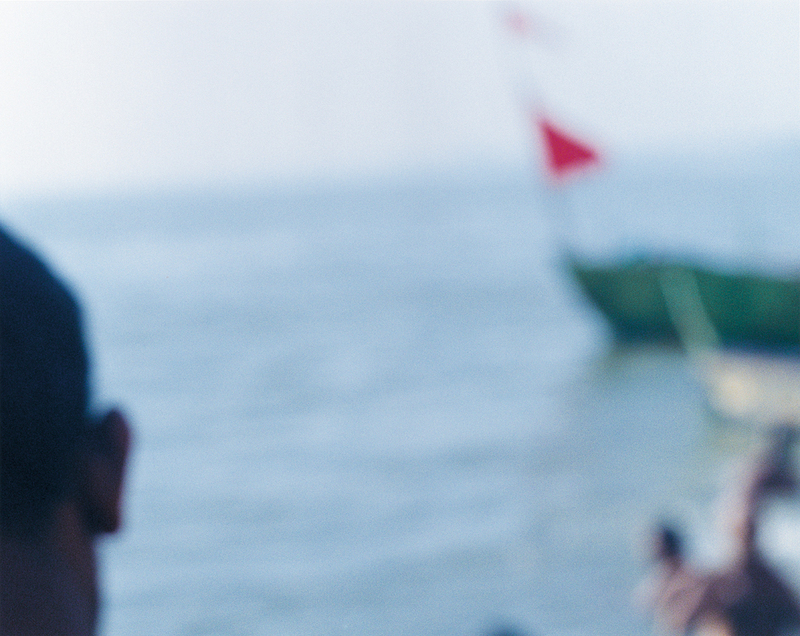 He photographs whatever comes within the frame within the half-day. Most of the photographs will be out of focus. The camera that was an alien object to people in the beginning has in no time at all been swallowed up by the chaos and becomes meaningless. Yoshihiko Ueda also becomes meaningless. What in the world is he doing? There is no such thing as a “proper photograph.” They are all photographs. The initial impulse of the photograph. The photograph can still replay the same kind of excitement that Niépce experienced when his image was imprinted for the first time. What must not be forgotten, however, is the fact that our ability to be pure has reached the point of being impossible. It is the discarding of the fact that we are human and responding to material objects that will lead the way. The power of the photograph lies not in the history of photography that has been organized and turned into a story. The force that attempts to deviate from, to run way from photography and its inherent lack of control has in fact brought life to photography. That is the paradox of photography. Yoshihiko Ueda chooses to let the focus do as it will, and in taking photographs of people and the river, attempts to generate the vivid power that lies in the origin of photography, without reference to place name or races of people. 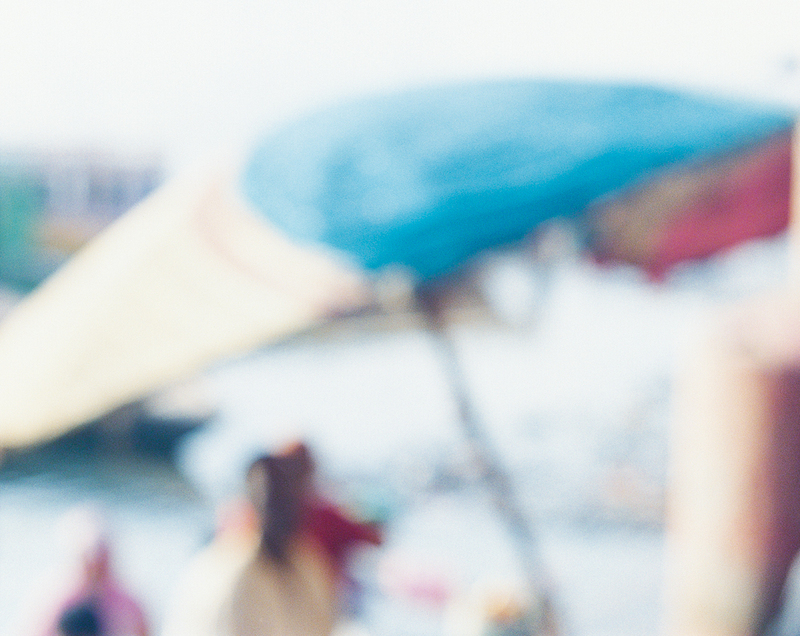 The people by the waterside lose their shape and change their color. However, such a splendid deviation! Now, the line of flight in the photographs that he has given the title “Materia” began in the woods of Yakushima, turned towards the river and the sea, and led to the river Ganges. It is of course however not the goal or the promised land, and the “topography of the photographs” is scattered here and there on the earth like the islands in an archipelago, connecting with each other and causing a chemical reaction that is larger than people would have anticipated. 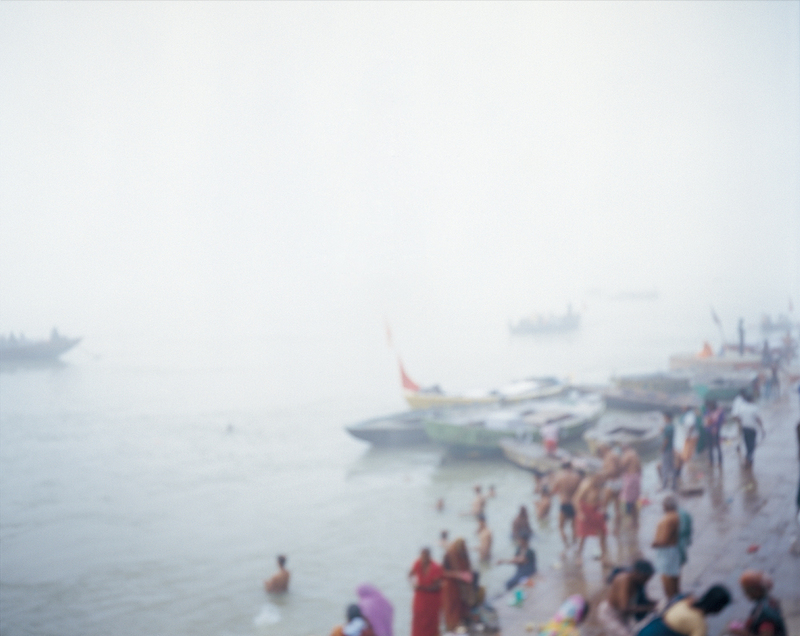 The photographs in “Materia: Ganges” are made up of multiple photographs, some from two and some from three. It is an artless form of expression that attempts skilfully to incorporate the transition of time, in which one can sense the series of photographs of the sea in Materia casting a shadow. The grammar when taking a photograph that is the non-determinist nature of the waves on the sea (no two have the same genesis. Yet, in repeating, appear to be the same). 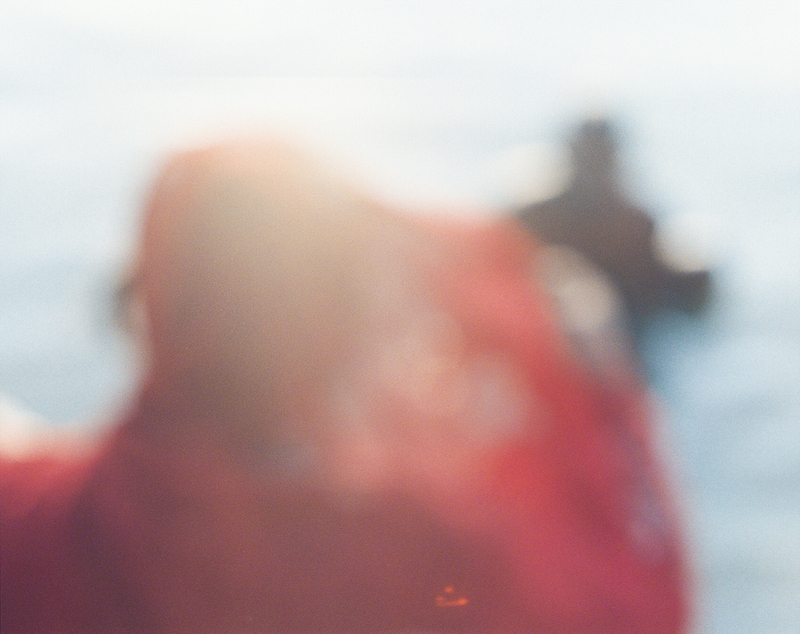 From the state of flux of the photograph, Yoshihiko Ueda relearns photography. He starts again. 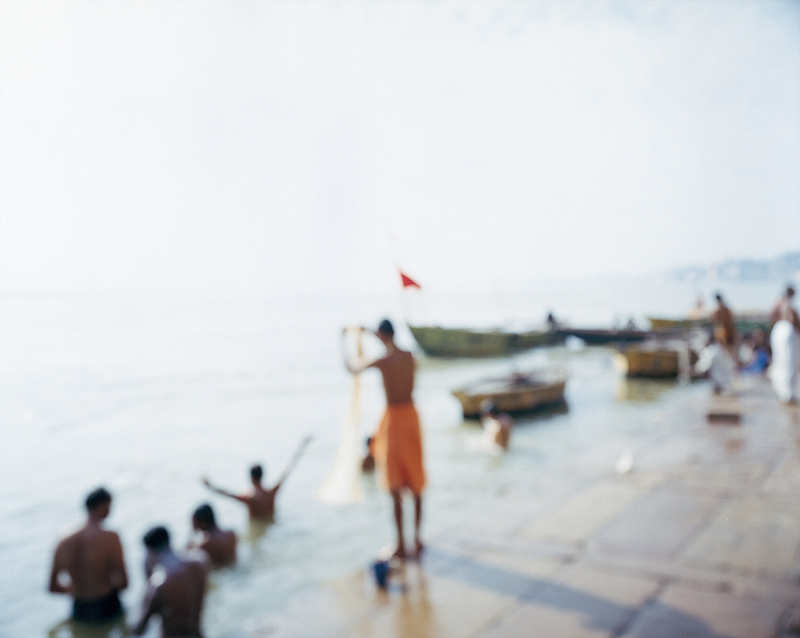 In “Materia: Ganges,” the people who appear in front of the camera accidentally are separated from the rest and their photograph taken. It is not a case of good or bad, correct or incorrect. Just the excitement of the latent image of the person emerging for the first time. A kind of halting excitement, such as that when hope and failure intertwine. It has no negative meaning. Despite the fact that it is impossible, Yoshihiko Ueda keeps trying persistently to replay it. It is a photograph of a brilliant deviation. 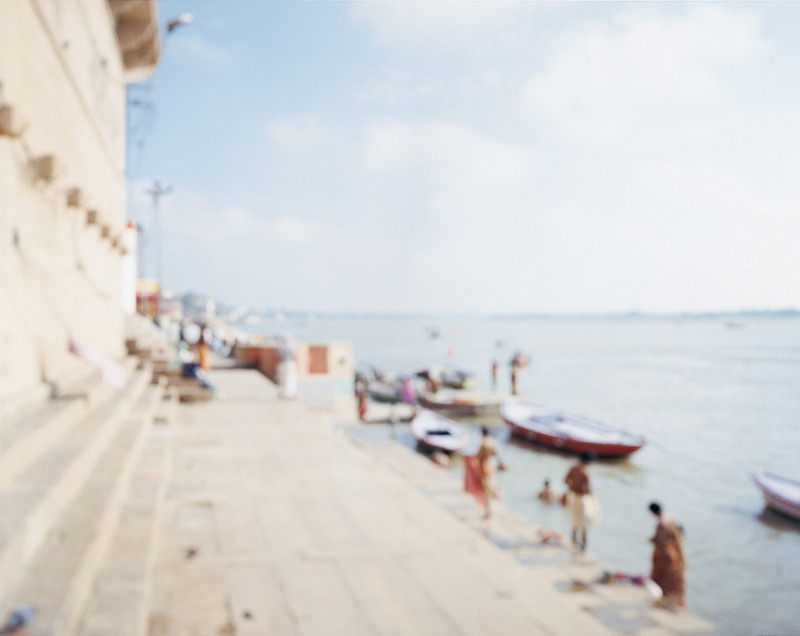 The line of flight called Materia leads the way to the Ganges, and attempts to extend to human figures also. Discarding the photographs of death and turning towards life is Materia. What direction is the state of flux of the photographs taking? Yoshihiko Ueda is a rare kind of photographer, one who commits himself to the turbulence of a journey that cannot become a journey and who enjoys the risk involved more than anyone else. 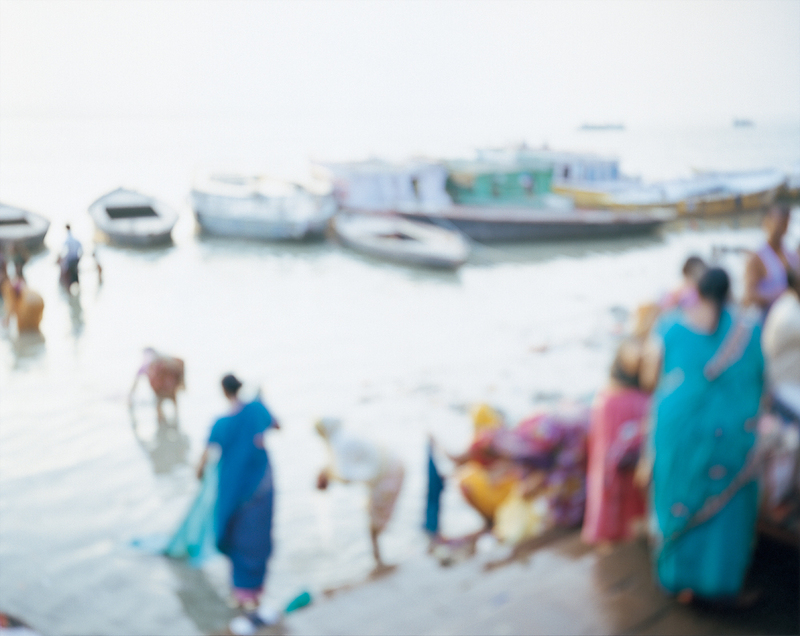 To coincide with the opening of Yoshihiko Ueda's photography exhibition “M.Ganges” the photography book M.Ganges is now available. 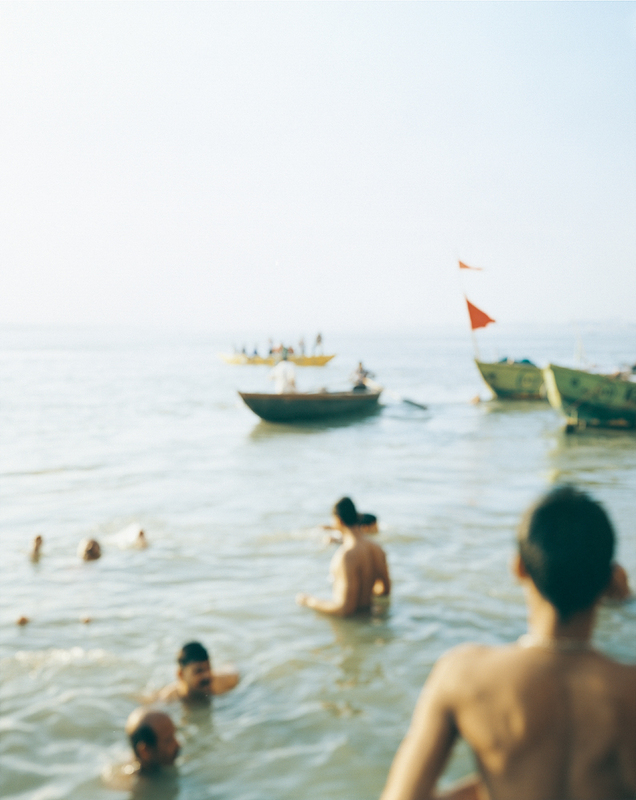 From forest to river, sea to people... “M.Ganges,” the last in Yoshihiko Ueda's M series tracing primeval memories, offers an irresistible smorgasbord of fifty-eight carefully chosen images.